(Look at that green background!!! Perfect for Project Spectrum May.) 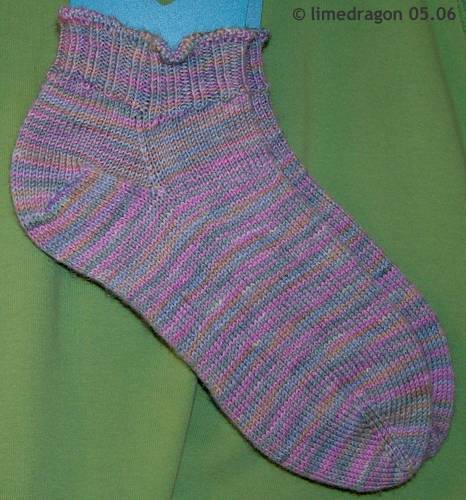 I started out with the plan to make a toe-up version of One Skein Sockettes. So I started with a pointy toe (I think the pattern yarn used is maybe sportweight and I didn’t adjust for the gauge difference). I figured it would be OK because Grandma seems to like her shoes and socks snug. When I got close to the heel, I thought I would do a short-row toe, but at the last minute, I decided to try a toe-up version of the heel-flap and gusset construction. That’s pretty much when I left any semblance of following the pattern and started winging it. I made a very wide heel turn, so the gussets are relatively shallow as well. (I only picked up 14 stitches along the heel extensions). You’ll notice that I didn’t do any type of slip-stitch or padded heel flap. I just didn’t feel like it, plus I worried that it would use up more yarn. After the gusset decreases were finished, the heel didn’t seem high enough. 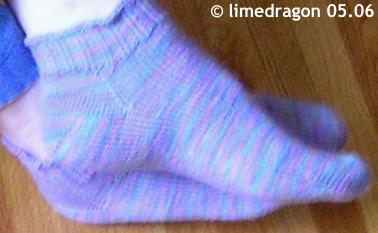 In more experimentation, I added six short-rows around the heel stitches, and that worked well. I will have to try that with short-row heels… that’s usually when I have that problem. I twisted all the knit stitches in the K2P2 ribbing. I had done this with K1P1 ribbing, but not with k2P2, and I like how it looks. The cuffs were 2 inches long when I determined I had just enough left for bindoff. None of the bindoffs I tried were loose enough. I ended up tinking back five rows. Then I doubled the total number of stitches by increasing in between each stitch. I knit two tubular stockinette rows (including the row where I increased), and Kitchener grafted together the stitches to finish off the cuff. I probably didn’t need to increase every other stitch, but I liked the ruffle edge the process created. I also used yarn-overs and the eyelets just underneath the hem or bind-off is a pretty effect, but it’s not easily noticeable while wearing, etc. I did make a mistake, I didn’t translate the tubular stockinette instructions from back-and-forth to round knitting, so the inside layer actually is reverse stockinette. I couldn’t get a picture of the effect, but it does create a distinct RS and WS at the top where I grafted the stitches together. In the end, I’m happy with the various things I tried and wiould like to try improving some of these techniques sometime. Here’s a quick snapshot of Grandma wearing her new socks. I’m sorry it’s blurry; I snapped the pictures very quickly and the light wasn’t the greatest either. I am loving that scarf on your sidebar under the title Random Image! And you said you don’t have time to design. Nicely done.